The site of a Nazi massacre of Italians during Germany's occupation of Rome towards the end of WWII, committed in retribution for a bomb attack by the Italian resistance. 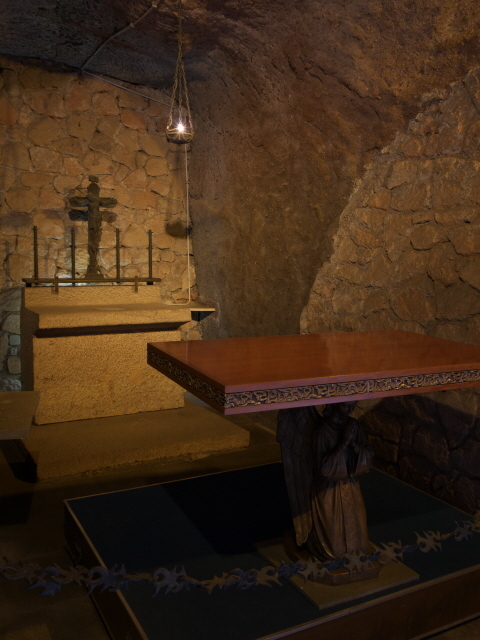 It's now a tomb and a kind of national shrine. More background info: By the summer of 1943, WWII had reached the Italian homelands, as the Allies landed in Sicily and began their campaign northwards. In the light of a possible defeat, Mussolini was deposed and imprisoned and the new government sought to agree an armistice with the Allies. But Hitler wasn't having any of this. He had his old buddy Mussolini evacuated in a daring rescue mission and then his Nazi troops took control over the parts of Italy that the Allies had not yet reached. It was indeed then mostly the Wehrmacht who fought the rest of this war on Italian soil. The new order of Nazi Germany came with all the horrifying trimmings. Now the Italian Jews (who had been relatively safe in Italy in earlier phases of the war) were hunted down and deported to concentration camps or death camps in the final phases of the Holocaust. The civilian population of Rome was subjected to the repressive regime of the Gestapo and SS. Political opponents and resistance fighters were especially targeted. Yet the Resistance movement in Italy fought back in partisan style. On 23 March 1944 they launched a bomb attack on a German police column in Via Rasella in Rome. The Nazis immediately decided to avenge this attack with the reprisal killing of 10 Italian partisans for every one of the 33 German Nazis killed in the Via Rasella attack. Hitler personally ordered the reprisal massacre to be carried out the very next day. Given the time pressure the Nazi henchmen were thus put under, no genuine effort was even made to find the real perpetrators of the attack. Instead, the 335 victims were chosen largely at random, including civilians just picked up from the street. Jews and political prisoners were apparently also amongst the chosen ones to be executed. But many others were just plain unlucky. This is especially true for those five extra ones who had been apprehended by mistake in addition to the required 330 for the 10:1 ratio. 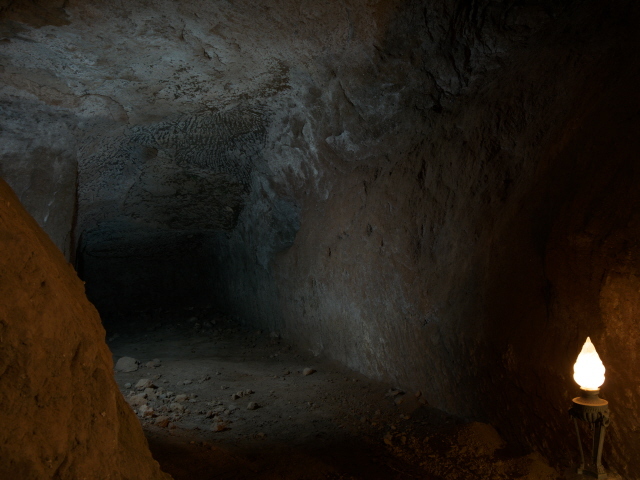 As the site for the atrocity the Nazis chose a cave system of a former quarry in a hidden location on the outskirts of Rome. The victims were shot one by one by single bullets in the neck. The five “surplus” victims were also executed in order to make sure the location of the massacre was not revealed. The whole operation took the best part of an entire day. As the bodies piled up, later victims had to literally kneel on or in front of the previous ones. When the whole killing spree was over, the caves were blown up, burying the victims under the rubble. After the liberation of Rome by the Allies a few months later, the bodies were discovered, exhumed and given a proper burial. The site was eventually turned into a memorial and national shrine of sorts. But it is not typically part of a regular tourist's itinerary, though the nearby Catacombs of Domitilla and San Callisto as well as the Roman relics on Via Appia may get even some mainstream tourists to stray to this site. But when I was there I nearly had it to myself. So it is really more a pilgrimage destination. The story of the Ardeatine atrocity was also the topic of the 1973 feature film "Rappresaglia" (in Italian, or 'Massacre in Rome' in English) starring Richard Burton and Marcello Mastroianni. The site is known in Italian as the "Fosse Ardeatine". What there is to see: not all that much. Once you are through the main gate and past the guardhouse you find yourself in a small plaza just opposite the entrance to the caves. To the left is a large sculpture depicting a group of tied-up martyrs in agony. On the brick wall to the left of the cave entrance are a couple of memorial plaques and a wreath. Two flagpoles fly the Italian and the EU flags. 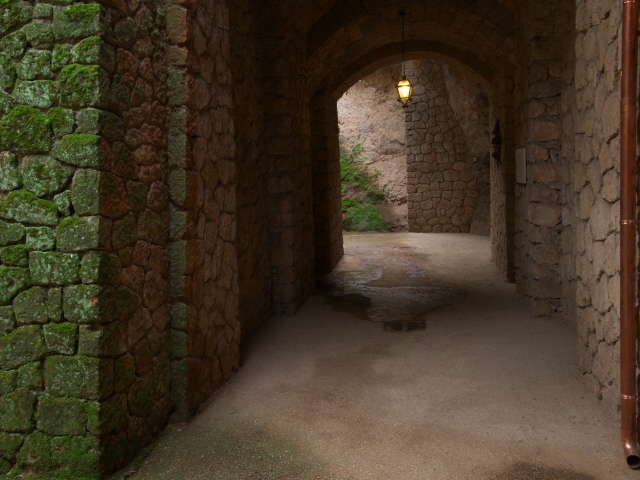 The entrance to the inside of the caves first leads past a small chapel room to the right and then deeper into the dark along a brick-wall corridor. 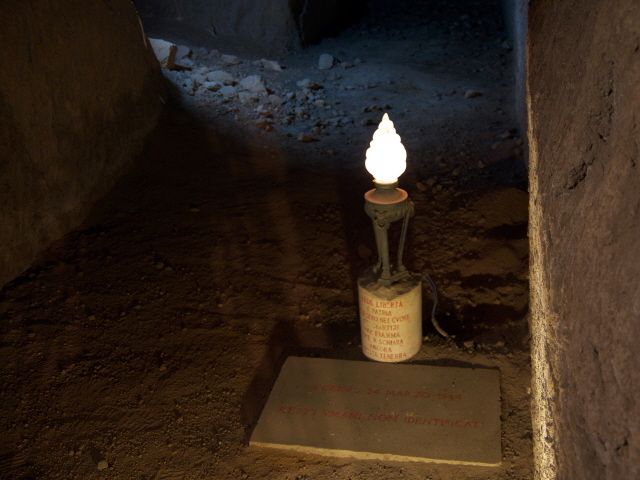 What has to be the actual massacre site is marked by a candle-like lamp and another plaque placed behind a cast-iron railing and in front of a darker empty space in the cave behind. More empty cave bits are unmarked and dark. But that's basically it and you have to simply turn back the way you came. Another brick-wall corridor then branches off to the right and leads to the mausoleum part. 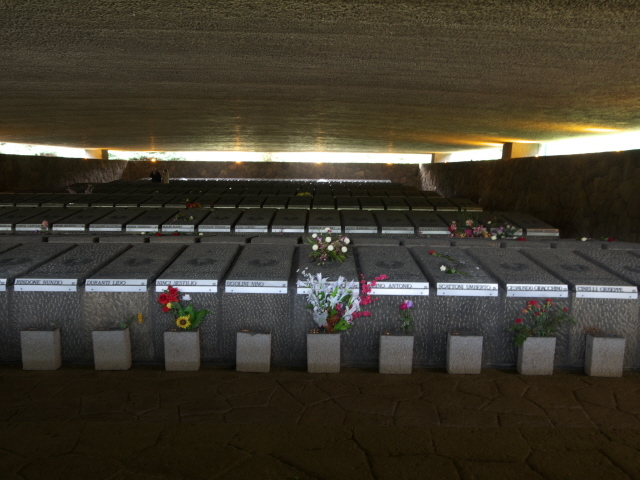 Here, under a huge lid of concrete is the burial chamber with the 335 stone tombs of the victims of the atrocity. They are named and on some a bouquet of flowers or just a single rose has been laid down. Behind the mausoleum there is also a small museum. It consists of a single oval exhibition room and there isn't all that much to see. All texts are in Italian only, but some of the photos and a few artefacts speak sufficiently for themselves, such as the pistols and caps with SS insignia. There's another smaller exhibition room labelled “Documentazioni”, which has a few more items, mainly photos and texts (also Italian only) about the construction of the memorial site. So there isn't much commodification or information, certainly not for foreign visitors who don't know any Italian. But given that this is regarded as the national shrine to what is seen as the worst war-time atrocity committed against Italians, its symbolic significance can hardly be overstated. Be aware, though, that it is a little pilgrimage outing only, not really sightseeing. For background information you have to read up in advance – or go to the Resistance Museum in the city centre of Rome (it offers more information, but again also largely in Italian only). Location: far in the south on the outskirts of Rome near the Via Appia Antica, some 3 miles (5 km) from the city centre. Access and costs: though located way out in outskirts of Rome, fairly easily reachable by public transport; free. Details: Despite the remote location, it is not difficult to get here as there are two bus lines that link the Via Appia area with the city centre. Line 118 goes from near the Circo Massimo and along the Via Appia itself. The even more useful bus is probably line 218, as this departs from Piazza Porta San Giovanni (near the Resistance Museum!) stops very near the Ardeatine caves just opposite the approach path to the San Callisto catacombs. From the bus stop the signposting could be better (look for Fosse Ardeatine), and initially I was a little unsure in which direction to go. Basically you have to keep walking a short distance further down Via Ardeatine, which bends slightly right so that the entrance to the memorial complex only becomes visible after the bend. Opening times: from 8:15 a.m. to between 3:15 p.m. (weekdays) and 4:45 p.m. (weekends), closed on certain public holidays such as 1 May, Christmas and 15 August. The museum closes 15 minutes earlier than the mausoleum part. Time required: not long. The caves and the tomb vault can be done in about half an hour or less. The small museum only takes up any extra time if you can read Italian, and even then probably no longer than another 10-15 minutes. Combinations with other dark destinations: Near the Ardeatine caves you can also find several of the catacombs of Rome, in particular the Catacombe di Domitilla and the Catacombe di San Callisto. Both are just a short walk away. Yet more catacombs and mausoleums line the nearby historic Via Appia Antica. More thematically related, however, is the Museo Storico della Liberazione which has many items related to the Ardeatine atrocity. The two sites can be rather conveniently combined as bus line 218 has stops near both of them. See also under Rome in general. Combinations with non-dark destinations: The Ardeatine site is near the Via Appia Antica, the famous ancient Roman road that leads out of Rome to the south. Not only are there countless catacombs along this route but also all manner of historical relics and ruins. This includes those of the Circo di Massenzio, which can easily compete with the more famous (but underwhelming) Circo Massimo in central Rome. The Via Appia itself is a regular street these days. Only further to the south do genuine Roman road flagstones become visible. At the level of the Ardeatine caves it is tarmacked. Nominally the road is closed to private cars on Sundays to give pedestrians and cyclists reign of this route. But that only works in theory. When I was there on a November Sunday there were hundreds of private cars using the street regardless. Either their drivers had special permits or they simply did not obey the Sunday rule. But whatever the reason, it means the stroll down this ancient road is by no means as romantic and peaceful as the car-less idea may lead you to believe, especially given that there are no pavements on the sides of the road, so you have to be really careful. Still it is a nice excursion into a rural part of Rome far from the chaos of the city centre. En route back to the city centre you can consider stopping at the imposing ancient city walls at the Porta San Sebastiano, which is one of the best-preserved stretches of the wall and there's even a small museum about it. For more see under Rome in general.